This will guide user on the steps to transfer all data from one iPad to another. Transfer includes all the menu data entries, image and archive. Other than transferring data, we will guide you on how to transfer your purchased license to the new iPad. 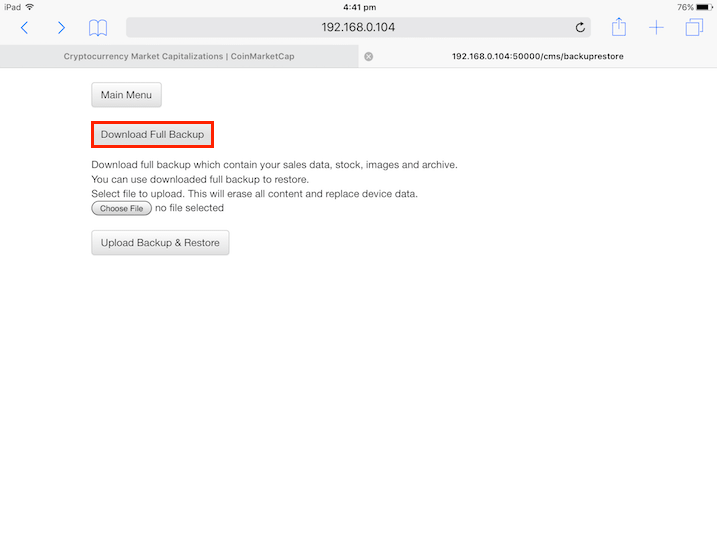 For example, if user wishes to transfer all the data from iPad A (existing iPad) to iPad B (new iPad), user will first need to download a backup from iPad A, then restore it in iPad B. The easiest way will be through CMS via Web. Firstly, user has to make sure that both devices are connected to the same Wi-Fi network. In iPad A, open up MobiPOS, go under Settings -> CMS via Web as shown in the screenshot below. If you do not see the URL link or it shows error. Please check your network connection. Next, in iPad B. Exit MobiPOS app, but open up Safari browser. Key in the URL link shown in iPad A into the safari search bar. 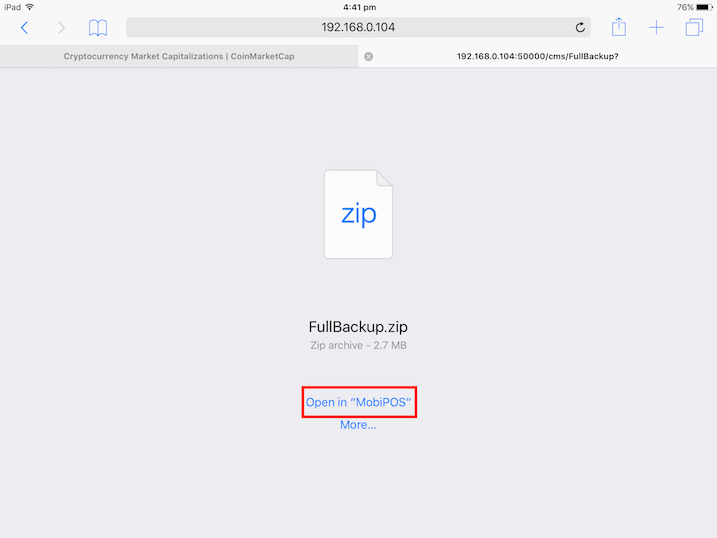 In iPad A, do not exit or close the MobiPOS "CMS via Web" page while backup or restore. In this example, the URL is http://192.168.0.104:50000/cms. In iPad B, if it loads successfully, it will show the page as below. 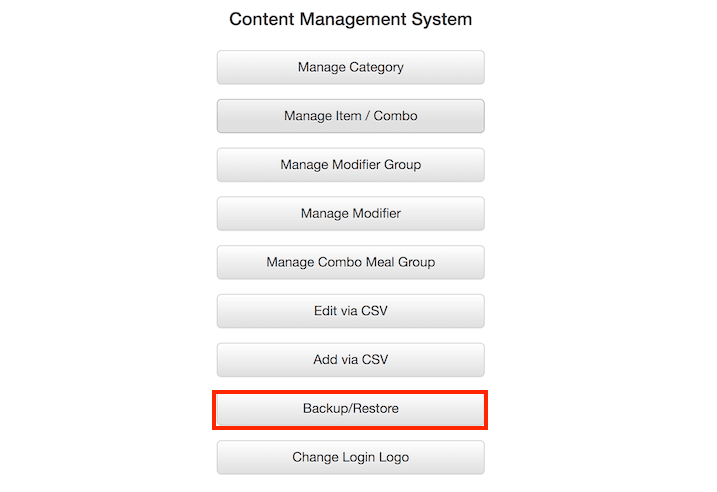 Click on the "Backup/Restore" tab as shown in the first image and it will lead you to the page as shown below. 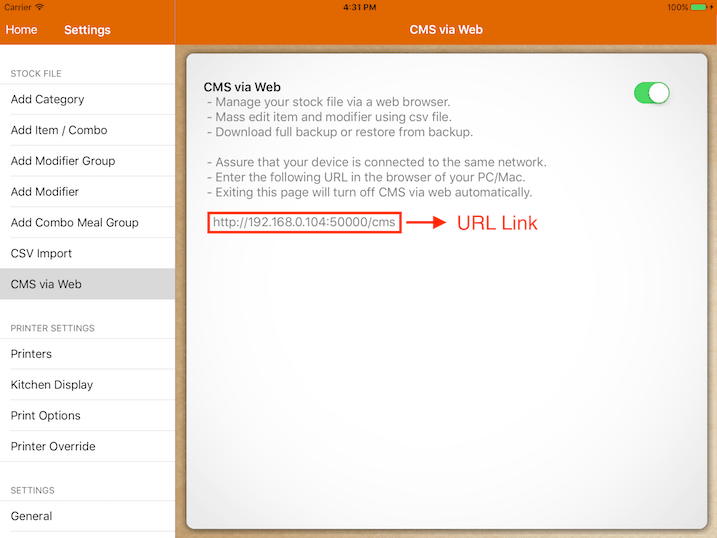 Please do not be confused with the URL shown as only 192.168.0.104 as Safari hides the full URL. Then, click Open in "MobiPOS". 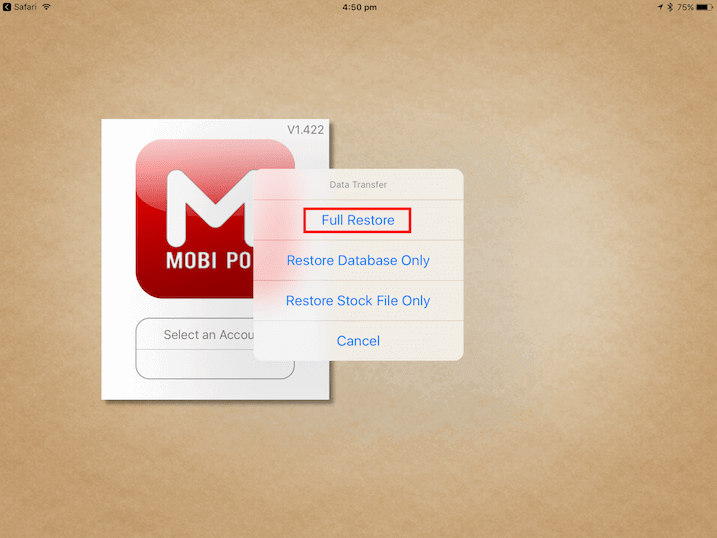 After that, MobiPOS app will appear and user can choose to restore database or stock files only or both. Upon restoring, user should check all data is transferred successfully. The best way is to check if the latest transaction is available in the new iPad. If the last transaction in the old iPad is POS072832, user should be able to find that in the new iPad as well. After restoring, user will need to logout the purchased license from the existing iPad to the new iPad. 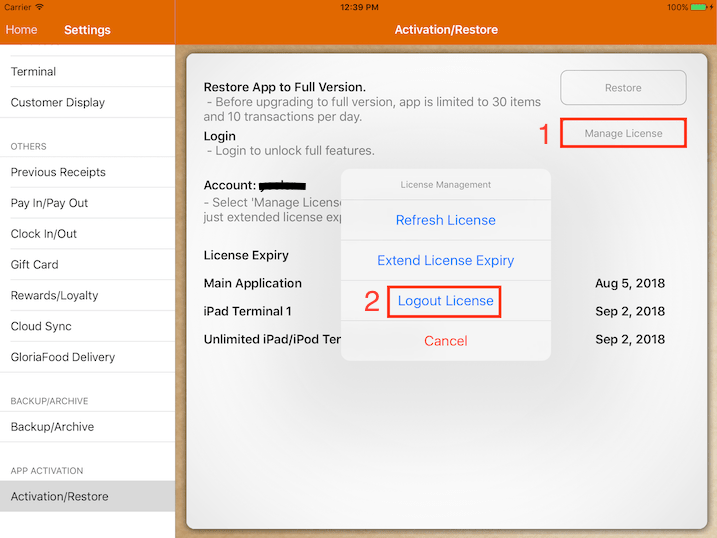 To manage license, in the old iPad go to Settings -> Activation/Restore -> Manage License -> Logout License . Then, at the new iPad, go under Settings -> Activation/Restore to login license with the same credentials. If you did not logout from the old iPad, you will get an error message saying "License is being used by another device". 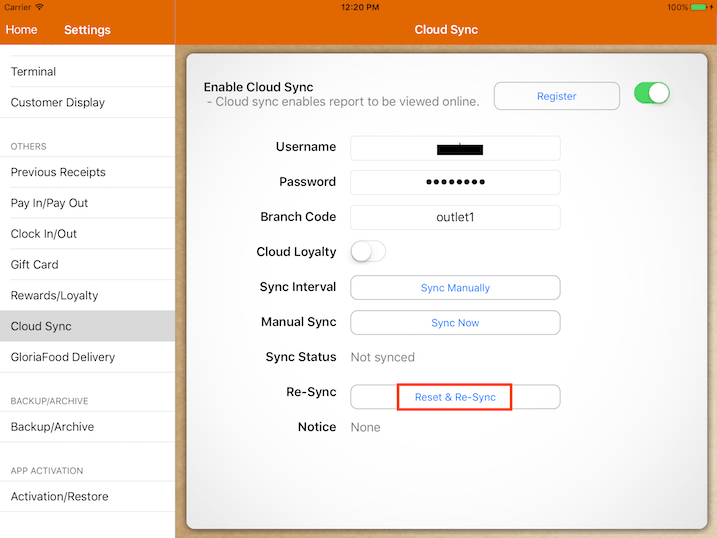 After transferring all the data, user can start activating Cloud Sync feature. To enable Cloud Sync, go to Settings -> Cloud Sync. First, turn off the Cloud Sync switch in the old iPad. Make sure the data restoration is successful before enabling Cloud Sync. If Cloud Sync fails to enable, user can choose to reset and re-sync. The Reset & Re-Sync feature will delete all the information online and re-upload all the data from this new iPad.